Ishaq bin Rahwiyyah (d: 238H) is one of the great scholars of Islam who was trained by At-Tabioon and followed their way in spreading the noble religion of Islam. He served the ummah with his great works in the field of Quranic exegesis and hadith. After his initial education, he was fortunate to have company of the great Imam Abdullah Ibn Mubarik (R.A.) to learn hadith. He then went on to study under other great scholars of time to acquire further expertise. Some of the knowledge centres he visited were thousands of miles apart. But this didn't stop him from pursuing his quest for knowledge. He also had an extra-ordinary memory and he had memorized a huge collection of ahadith. He could even dictate thousands of ahadith to his students from memory. He used to say that 70,000 ahadith remain in front of my eyes all the time. Famous mohadith (hadith scholar) says that "I have not seen anyone with such strong memory". Those who benefitted from his light include Imam Bukhari, Imam Muslim, Imam Tirmidhi, Abu Dawoon, Nasai, Imam Ahmed bin Hanbal and others. All these scholars have quoted narrations from Ishaq bin Rahwiyyah in there books. 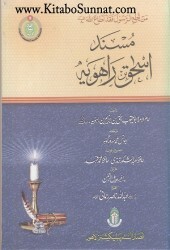 He not only worked on teaching and scholarship of hadith but also wrote numerous books. The book you are going to read now was initially on organization in 'masad' theme. The term Musnad is applied to those collections of ahadith which give the ahadith of each Companion separately.However, considering the readability and understanding for greater population, it has been transformed and re-organized in 'fiqhi' theme. May Allah make it beneficial for all of us.